It's mango season here in the region. The groceries are full of the most delicious mangoes: big, ripe, heavenly-sweet, melt-in-your-mouth mangoes! My kids happily take them as alternative to chocolate or sweets that they pester me for at mid-afternoon. While my whole family likes to eat the mangoes just by themselves, I love a combination of sweet, salty, bitter and other flavors. 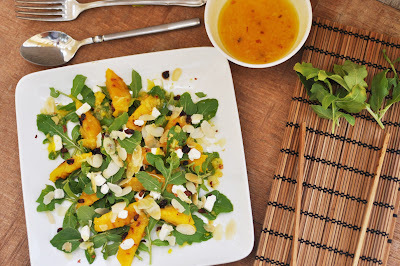 This Mango Arugula Salad is one of those concoctions: sweet mango, bitter arugula, salty feta, fruity-sour dried cranberries and nutty almonds take me to heaven.This salad is whipped up in no time. A perfect lunch for me (that I don't have to share :-)! In a dry pan, toast the slivered almonds for a couple of minutes, until lightly browned. Set aside. In a small bowl, combine all dressing ingredients. Stir well. Set aide. Wash and dry the arugula leaves. 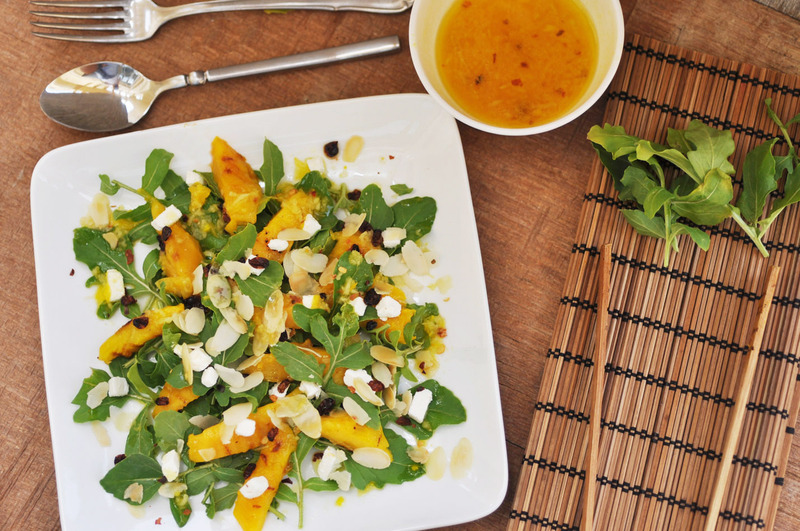 In a salad bowl, combine arugula and diced mango. Pour over the dressing and stir until coated. Sprinkle over with feta cheese, cranberries and roasted slivered almonds. Ready to serve.